To be honest, I'm not sure what made me pick this book up. 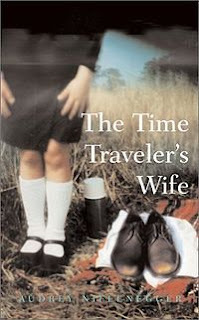 Obviously I remembered the huge hype that there was when the film adaptation came out, so I was in two minds about The Time Traveler's Wife when I picked it up second hand. On the one hand, often there's something prompting the hype meaning that it's probably pretty good, but on the other hand hype is very bad for raising impossibly high expectations, thus causing disappointment when the book doesn't live up to the hype. But, considering that it's been years since the hype died down, I decided that this would be a safe time to take a look. So, you probably know what the novel's about, but this is my turn to talk, so I'll tell you anyway. This is the love story between Clare and Henry. Of course, it isn't that simple, it never is in fiction. The main complication in this relationship is that Henry has a genetic condition that means that he will, often in times of stress, travel back or forwards in time. This is actually quite well implemented, especially when the two first start dating; Henry has never met her before, whereas Clare is well aware of who he is because she has seen several of his future selves throughout her childhood. The time travel itself brings up a lot of questions about the nature of fate and whether the future is already determined or whether we can use free will to affect the past or the future. It can get kind of depressing, but the sheer amount of optimism in Henry and Clare's relationship negates that for the most part. Regarding that, I have to praise the book for its focus on a long-term couple and for making the relationship so...human. What I mean by that last point is that it feels utterly true to life, with flawed characters leading out lives with decisions that aren't necessarily the right ones and having to get one with the consequences. It's a refreshing change from insta-romances and affairs that progress without a hitch (or ones which are plagued with nothing but misery). The characters are similarly human. There's Henry, who is a bookish girl's dream (probably on purpose) as he's intelligent and cultured, but at the same time prone to depression, losing his temper and alcoholism. Clare is patient and creative, but gets more and more prone to irritation as the number and length of Henry's absences increase throughout their married life. There are other characters who appear at various times in their lives, such as Gomez, a liberal lawyer with an unrequited crush on Clare; Ben, an AIDS sufferer friend of Henry's and Ingrid, an angry ex-girlfriend. To be honest, I'm not sure what else to say, considering that this is quite widely known. The only other thing that I can think of to say is that if you haven't read this yet and want to, I would recommend keeping tissues nearby when you get towards the end; it's the closest I've gotten to bawling in a long while. Honestly I forgot what it was that I really enjoyed about this book until reading your thoughts--it's the raw and real characters--not perfect prototypes but like you mention, flawed. I did bawl when reading this one--terribly. Though there are some inconsistencies that to this day I just can't wrap my head around. So glad you enjoyed it despite the hype!